Instruments used in war to frighten the enemy. These instruments are very loud and unbearable to the human ear, e.g., bells used by the ancient Egyptian kings, instruments used by the Byzantine kings, or shouters used by the Persian kings. Zafn, which consists of moving the shoulders, eyebrows, head, and similar organs. These are only movements, and they generate no sound. Clapping, dancing, playing the tambourines, playing the hour-glass shaped doubled headed drum, and playing the cymbals. All these are of a similar class and they are superior to the zafn by the fact that they produce a sound at the end of the movement. However, they do not produce musical notes. The ūd (lute), tunbūr (long-necked lute), mi'zafa (lyre), rabāb (spike fiddle), and mizmār (oboe) are superior to the above ones because they produce musical notes. Nothing is more perfect than the voice because it contains all the qualities of the above instruments, and, probably in the mind of Al-Fārābī, because it uses words that have meanings and express emotions. Al-Fārābī then divides Category 4 into instruments that imitate the voice best; that is, those having a sustained sound similar to the voice and almost affect the listener the same way, such as the rabāb and the mizmār, then the ūd, and then the mi'zafa and instruments similar to it. 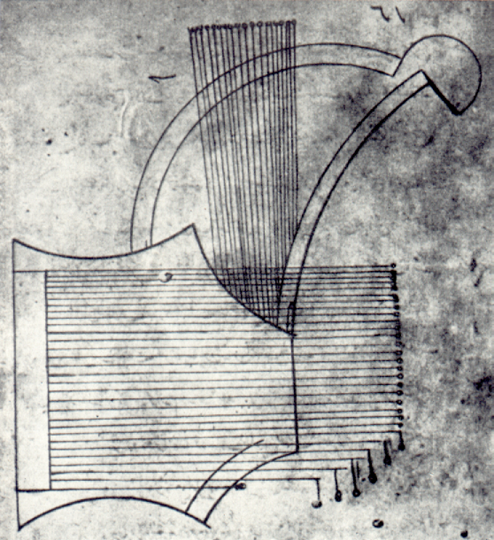 ABOUT THE PHOTO: This drawing appears in al-Fārābī's The Grand Book of Music. 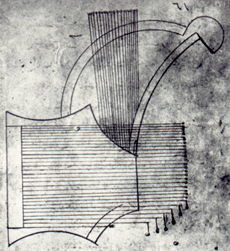 It depicts a musical instrument known as a shahrud. Part 2: Tarab: Three Examples of Songs. Background information about three historic songs that provide opportunity for experiencing tarab.